Please Note: Only Register if you wish to upload and display listings and adverts on this site. If you are searching for Holiday & Travel Deals click here as there is no need to register. You will NOT be charged for Registration on this site. When you click the Register Now button, you will be taken to a Registration Page like the one shown here. 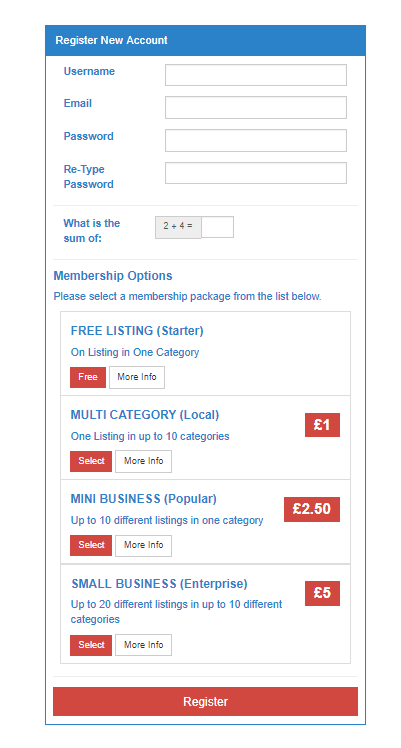 Confirm your choice of Membership Option by clicking on the appropriate SELECT button for the Membership of choice (or the FREE button for a Free Starter Listing). The button will now turn GREEN. Now scroll down to the bottom of the registration form and click REGISTER. To Login just click the Log In Now button. or Click the MEMBERS AREA tab on the navigation bar above. Please note that every time you are logged in, the MEMBERS AREA tab will read DASHBOARD. Use this to access your account and and your account settings. Please note that you can only login once you have registered. If you go to the login page without registering there is a Register button on the page that you can use.